If you think HBS doesn't have a thriving tech culture, then you know nothing, Jon Snow! 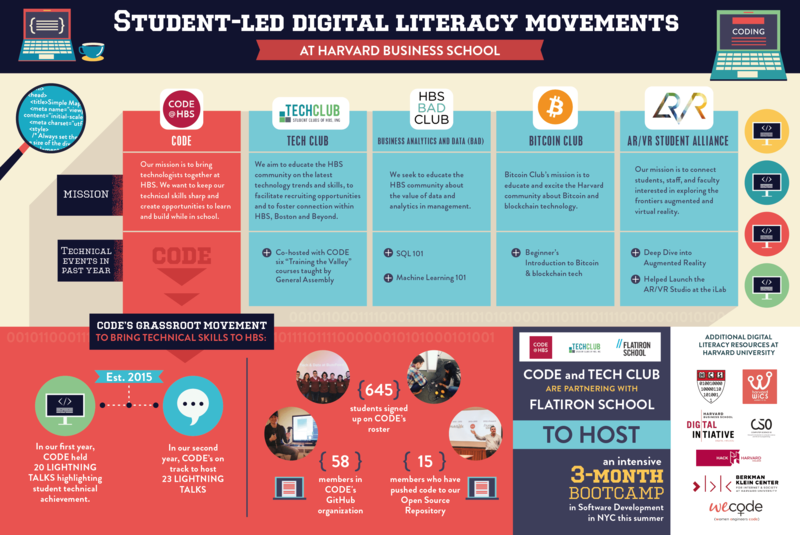 Last spring, we published a Harbus piece asserting that “coding is the new business literacy.” As we look back on the student-led digital literacy movements at HBS over the past year, we’d say that the student body agrees. There’s a blossoming ecosystem on campus of tech-driven clubs, hackathons, and ventures. It’s hard to believe that in 2015, HBS lacked even a computer science club. Fast forward to 2017, and CODE is one of the largest, most active organizations at HBS. Many other new clubs have also come to life and become technical beacons on campus. Business Analytics & (big) Data Club (BAD) regularly hosts popular SQL 101 and data science workshops. Bitcoin Club is teaching MBAs about the technicalities of blockchain. Harvard AR/VR Student Alliance connects Harvard students, staff, and faculty interested in exploring the frontiers of augmented and virtual reality. All of these clubs are united in the strong belief that learning happens by building — not by lecturing. This article is the first in a Harbus series highlighting technical clubs on the HBS campus. Today, we’re going to dive into CODE’s members and vision for the future. CODE was founded in the fall of 2015 by a group of RCs who wanted to bring technologists together at Harvard Business School. Some of us were former engineers who wanted to keep the toolkits sharp during their time at HBS, while others were enthusiasts who wanted to learn the basics and how to better communicate with engineers. We believed then, as we still do, that HBS needed a place where engineers could meet to discuss technical topics and the student body as a whole could come to gain that first toe-hold into the richness, and modern necessity, that is coding skills. Over the past two years, over 650 students have signed up for the CODE newsletter or come to one of our events. Every week CODE hosts a 30-minute Lightning Talk, where a student shares a demo or project and talks about a piece of code that they are particularly proud of in their codebase. This past year, CODE started experimenting with external Lighting Talks. Colleen Tapan (HBS ‘18) brought in engineers from the IBM Watson team to share their work with the Open Crime Project. She also partnered with the Harvard AR/VR Student Alliance to bring in Richard Dulude (HBS ‘15), who gave a hands-on demo for how to build a VR experience in Unity. These sessions gave students a starting point to launch their own side-projects. This semester, Jesse Orshan (‘18) and Paul Yarabe (‘18) recognized a need to support earlier coders and launched CODE Bootcamp. The group now meets once per week and teaches students how to build side projects in Python. Although it started out as an experiment, the student response has been tremendous, with nearly 100 students showing up each week for training. We’ve also worked hard to expose HBS coders to outside resources and are proud to share that CODE and Tech Club have partnered with the Flatiron School to host an intensive 3-month bootcamp this summer in Software Development for HBS MBAs in New York City. At CODE, we believe that the best innovations occur across schools and companies. This past spring, Heather Engel (HBS ‘18) partnered with Billie Wei (Harvard College ‘17), the President of Harvard Women in Computer Science (WiCS), to launch the inaugural WiCSxCODE Mentorship program, which matched 16 pairs of college undergraduates with technologically-oriented HBS students. CODE has also sent multiple teams to both HackHarvard, HackMIT, and WeCODE every year. The results have been spectacular. What are CODE members working on outside of the club? New side projects are spinning up every day, and we have countless additional examples we could share from our members. Our mission at CODE is not to be an incubator or entrepreneurial organization. Harvard prides itself on being one of the best business schools in the world for Entrepreneurship and it has heavily invested behind that mission. The Harvard Innovation Lab, Rock Accelerator, and Entrepreneurship Club are all prominent forces on campus. HBS students are surrounded by senior entrepreneurs, world-class lawyers and are trained to identify good businesses and structure favorable term sheets. However, Harvard has historically underinvested in the engineering skills students need to turn these ideas into products. CODE and the other technologically-oriented clubs are the grassroots, student-led response to fill that gap. We seek to bring the technologically-curious community together to turn ideas into the leading companies of tomorrow. 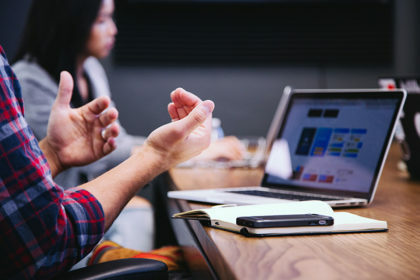 These skills apply to careers beyond entrepreneurship — technical skillsets are becoming increasingly valuable to all types of organizations, regardless of size or focus. No matter where you plan on heading after school, the job markets are already changing. ECs are increasingly finding themselves in technical interviews. GE CEO Jeff Immelt has made a public announcement that all new hires will learn to code. We believe we are heading at full speed towards a future where nearly all business leaders will need to be technologically literate, and we want to prepare our peers for those experiences. 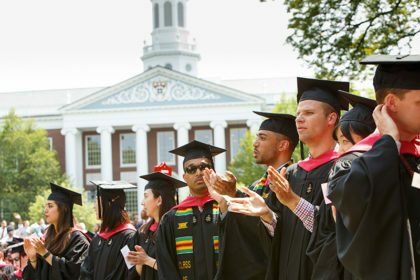 What academic opportunities exist at HBS to gain technical skills? Today, the academic options HBS students have for technical advancement are both limited and only available to second years. All in all there are fewer than five engineering and data-rigorous courses in the current HBS curriculum. Julia Austin, the CTO of Digital Ocean, teaches PM101/102, where students build products hand-in-hand with an engineering team. Jeffrey Polzier teaches a data science course called People Analytics. David Malan teaches CS50 for MBAs, an over-subscribed Q4 class at the end of EC year, which is a slimmed down version of CS50, the most popular undergraduate course at Harvard College since 2014. CS50 is taught in the fall, and a number of HBS students cross-register into it each year. The HBS Digital Initiative and other faculty within the administration are working to bring more academic options into the curriculum. We believe this will be a great benefit for students professionally as employers demand stronger technical skills. Some of the most obvious opportunities are in the RC year: incorporating digital literacy and coding into TOM and data science and engineering into MKT. We believe another option Harvard should consider would be to allow pre-MBAs and current students to apply their student aid towards coding bootcamps, like the Flatiron School, in the summers before, during, or even after their Harvard programs. Coding bootcamps are eligible for student loans — and we believe Harvard could be a pioneer by making this an additive part of the HBS curriculum. I’ve always wanted to become more technical. How can I get involved? First, check out the Tech Starter Kit from the HBS Digital Initiative. In it, you’ll find all the technical clubs, workshops, and groups across all the schools at Harvard University. Sign up for CODE, Tech Club, BAD, Bitcoin Club or AR/VR. We all partner on multiple events, so you’ll likely get a taste of many of them over the course of the year. We also have opportunities for, and encourage, learning at home — and you can join the CODE GitHub over the summer to set up your computer and try out a few intro to coding challenges. Consider swapping out your internship or delaying your start-date for a coding or data science bootcamp. Nearly everyone we’ve met has said that these programs have been empowering, fun, and changed the way they view the world. It’s never too late to start. With how quickly technology is changing, even the “best” in the world often become beginners again. We know this is only the beginning of the digital era, and we’re here to bolster Harvard as it navigates the next chapter of the journey. But never forget, it is incumbent upon each new generation of students to keep that movement going. See something that’s missing in our community? Speak up and host a workshop or start a club. Think the curriculum should be updated to fill a skill gap? Petition the school. As Darwin would say, “Evolve or perish.” You all have the power to push these critical ideas forward. Use it. Why did you get involved in CODE? For some time, it has been my goal to gain basic coding expertise. I attended bootcamps and workshops but still found coding to be intimidating. The resources out there can be overwhelming. CODE was a great way to learn more about development from my peers at HBS and have a group of people learning alongside me. I am a creator by nature, and I wanted coding to be part of my creative toolkit. I am a writer – I published my first novel in 2013. When I have an idea for a story, I can make my vision come to life with words on a laptop or with pen and paper. I have so many ideas for apps and software that I wish to create, but I was limited by not currently having robust coding skills beyond HTML and very basic CSS. I found it frustrating that I couldn’t bring my vision to life myself and had to rely on others to do so! CODE put me on the path to changing that. What were your favorite tools and resources you used while in school to learn? The weekly CODE bootcamp used CodeAcademy to teach us Python, which I really liked. I also attended bootcamps from General Assembly when they came to campus (front-end and back-end web development). Do you think technical skills will be an important asset to you in the future? Why? I think that coding is the closest thing to a superpower that we have. I plan to work in entertainment and I’m sure that my future roles will require me to delve into using existing and new digital distribution methods to distribute media content. I want to be able to speak with the programmers I’d be working with, and be able to quickly assess what is possible and what is not in terms of development. I’ve been coding for most of my grown-up life (some may say I never really grew up, though). The best managers I’ve had were the ones who could share a common language with me – ideally, C or C++. Hah! But seriously, managers who can’t understand the challenges and opportunities in technology are setting up for failure. It was great to meet like minded people and learn from them. We hear you did an independent project in Cryptography. Can you tell us more about that? What’s a side project that you’ve been hacking on recently? Don’t laugh – but our toilet dispenser at home broke, so I decided to make a new one. And by that I mean 3D print, mold and cast, and create a custom-made circuit board with USB charging, a motor, and a detector for when you run out of paper. It also has backlighting and Wi-Fi connectivity with the option to order goods from Amazon when you’re about to run out. I got involved with CODE at the beginning of my EC year, after I decided to focus my career search on product management roles. To ramp up my technical skill set, I started teaching myself to code using several online learning platforms. CODE’s supportive community complemented my learning and helped me keep at it when the going got tough. Crucially, CODE helped me envision myself as someone who can be technically proficient, no matter how far away I may be from big tech’s stereotype of an engineer. As you recruited for PM roles, how useful (or not) did you find a technical skillset to be? The short answer is “incredibly useful.” The longer answer is that it really varied interview to interview and company to company. I had interviews in which I was asked to white-board code and others in which I was the one pushing a more technical angle to make sure my interviewer knows that I can hold my own with engineers. Regardless of where on this spectrum any given interview fell, however, having a nuanced technical understanding of how a particular product (real or imagined) might possibly work enabled me to speak more intelligently to feature ideas or design improvements. What recommendations do you have for other students looking to take PM roles? First, don’t take the easy route. If you really want a career in PM, sooner or later, you’ll want to get more technical – take the plunge now, even if you’re going for a “business PM” role. Second, make your goals clear and be vocal about your focus. It’s easy to be pigeon holed into job opportunities based on past experience, so it’s important to assert (and reassert… and reassert) that you’re in the market for a PM role. Finally, don’t give up. Especially if you come from a social sciences or liberal arts background, like I do, it can be an uphill battle to break through and get people (recruiters, other PMs, potential mentors) to give you a chance to prove yourself. There is no formula to becoming a PM – so don’t let a winding path discourage you. I’ve always enjoyed entrepreneurship and tinkering with ideas, so when I first heard about CODE I was immediately hooked. What drew me most was the chance to improve my coding by spending time with classmates that had, you know, actual coding skills. CODE helped me expand my skills, push my own side projects further, and the Lightning Talks are addicting. You went to a coding bootcamp before coming to HBS. Why did you choose that path? I knew that for what I wanted to do in life coding was going to be an important skillset and, quite frankly, I just didn’t have it. Bootcamps seemed like the most efficient way of getting there and I sensed that if I didn’t go before school I might never end up taking the plunge. For me it was perfect because now I can build MVPs for any idea I have, which was my goal. Be able to make the basics and fluent enough to work with engineers. Bootcamps are a fantastic path to that. What was your favorite experience with CODE these past two years? I think my favorite experience was the first HackHarvard, during RC year. CODE was still pretty new at that point and going to the opening the first night felt like a bonding moment. I consider myself incredibly fortunate to have been part of the founding team and, at least to me, that event felt like a true kickoff for the club. Plus, Sam Li and I made a great GroupMe hack that spits out metrics and other goodies, which in HBS lore pretty much makes you king. So there’s that. What exactly do you do here at Harvard, and where does your “cult following” stem from? I teach CS50 at the college, which is the introductory computer science course for majors and non-majors. We have ported over the class to HBS with CS50 For MBAs, which is a variant of the college course. At HBS we focus on top-level design decisions as opposed to lower-level, bottom-up implementation. How can HBS students get involved in more technical work in the classroom? In CS50 for MBAs we give students a very-quick taste for programming. However, at the college, which the MBA students are welcome to cross-register during their EC year, we immerse ourselves in coding. In CS50 at the college, the technical and engineering returns are notably higher in this full-fledged course. HBS courses like PM101 and 102 are also advantageous particularly if the students work on some of the engineering themselves. Students can also get involved in Harvard Computer Society, HackHarvard, and Women in Computer Science (WiCS). Also check out CS50.edx.org for our remote CS50 course. What types of partnerships would you like to see over the next few years between HBS and the College? I’d like to see more technical and business minds coming together. There’s an opportunity to build an ecosystem that solves technical and human challenges with technology through collaborative approaches rather than unidirectional approaches (e.g., business students needing an engineer to achieve their vision, or engineers needing someone to sell their vision). There’s a lot of opportunity to bring the two sides of the river together. The Digital Initiative at Harvard Business School builds expertise and community around the digital economy, and fosters the exchange of ideas between HBS and the broader world. We also work to accelerate the school’s own digital transformation. What’s it been like to work with CODE? Trying to hang on to a high-speed train? In just two years I have seen CODE morph from a modest idea to a robust community with a very clear mission. It’s incredibly affirming to watch this collection of curious, agile and collaborative students grow at such a rapid pace. What do you hope to see at Harvard Business School in the next few years? The Digital Initiative is founded upon the idea that business leaders should possess relevant tech literacy. We hope to see the HBS experience holistically reflect this necessity in response to technology’s foundational role in organizations and society. CODE (est. 2015) is a student organization at Harvard Business School. Our mission is to bring technologists together across Harvard.